Though our custom wall mural and wallpaper services are well suited for many spaces and requirements, there may be no better match for custom wallpaper than the museum or exhibit space. There is no cost-effective, quicker, or better suited option for combining both imagery and verbiage than custom wallpaper. As our custom wallpaper is printed in panels, installation is very simple, especially when completed by a professional wallpaper hanger. With the wallpaper preparation, hard signage and cut lettering is eliminated, ensuring a much less expensive and timelier install. The image above is from the Motown Historical Museum in Detroit. 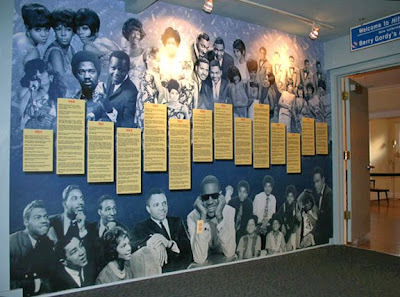 The custom wall mural is a timeline, laying out important figures and dates within Motown's history. It's plain to see that even though so many prominent performers as well as information are included in the mural, the finished look is still clean and easily understandable. The Motown Historical Museum is an incredible landmark, and should definitely make it on the to-do list of any traveler in the Detroit area. The "Snake Pit," the original recording space where many of Motown's first hits were produced, is still intact and positively still radiating an incredible energy. In addition to the Motown Historical Museum, we also did custom wallpaper printing for the Elvis Presley Birthplace Museum. Even though these examples are from the highest tiers of the recording industry, our custom wallpaper can be used for a display space in schools or daycare situations as well, anywhere that information needs be displayed in an engaging manner that will captivate your audience. Contact us to learn more!